Using a light aircraft such as a Cessna can be the best way to get your imagery if you need to cover a large area. Especially if your resolution requirements are not too great. In California you can use the local flight school at a municipal airport to buy an hour of airtime at a total cost of under $300/hr. This cost will be lower in other places and still represents a great value in terms of the amount of imagery that you can collect from one hourlong flight. I like using rubber hand clamps. you can get them at your local hardware store, they are easy to use, and do not damage the aircraft. You always have to ask the pilot for permission, but that has never been an issue for me. But you should mention when you make the appointment that you would like to do aerial photography and you have a camera mount that you need to get the pilot to approve for using on the flight. The hand clamp is nice because it is so universal. You do not need to set it up before takeoff. 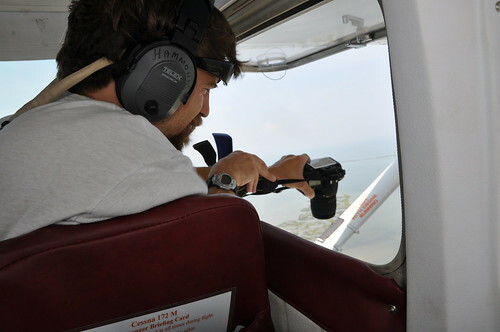 With a high-wing Cessna, open the window at altitude and then attach the hand clamp. Always hold on to the clamp while using it during flight. This is not only a safety measure (along with tying the setup to your person), but it is important to hold onto the assembly to dampen vibrations from the aircraft. Cool - do you have a pic of the backup tie-off between the camera and you? Do you tie it to your belt? I just looked and could not a picture but I have just taken the camera strap and tied it to my upper arm, or my belt. It is more symbolic than anything. The camera could possibly damage the tail of the plane if you dropped it. But I never want to find out :) So I hold on tight with both hands and practice the routine of pulling it out and tightening the clamp while on the ground so that during the flight when there is more wind and noise it is familiar. The shorter the clamp, the easier it is to use and hold without vibrations. 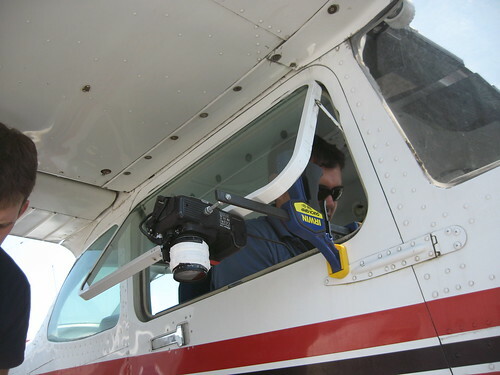 Do not worry if part of the plane partially obscures the camera. It is only a problem if the camera is in auto focus and it is focusing on the plane instead of the target surface. A few words of warning with these clamps... As a carpenter, I no longer buy these irwin quick clamps. Three of them have broken on me due to over-tightening, by hand... They all broke in the same place, at the most narrow cross section of the lower jaw where the lock/quick release lever rests inside the semi-circular groove. In time any tool can break, so maybe what I'm trying to advise is this: use a shackle and safety cable too.